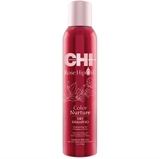 CHI Rose Hip Oil Dry Shampoo adds lift and texture to hair helping to revive lifeless strands while UV protectants help protect against color loss and fading. A scientifically formulated low pH color maintenance system, Rose Hip Oil is naturally low in pH, allowing for moisturization of the hair while keeping the cuticle closed, locking in hair color. 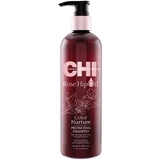 The Chi Rose Hip Oil Color Nurture Shampoo contains rose hip oil, vitamin C and antioxidants that will prevent color loss while increasing shine and vibrancy. Hydrating Shampoo Shampoo with high moisturizing and detangling properties. From the first application the hair gains a more silky and shiny look. Benefits: Controls the frizzy effect. It leaves hair incredibly smooth and shiny and easier to comb. How to use: Apply to wet hair, distributing evenly. Rinse thoroughly. Protective Shampoo Shampoo specifically studied for colored hair or with highlights, to protect the hair fiber from any external aggression. Benefits: Deeply nourishes the hair while protecting and extending the life of the color. The hair looks soft and smooth. How to use: Apply to wet hair, distributing evenly. Rinse thoroughly. Purifying Shampoo Purifying anti dandruff shampoo. It works since the first applications to eliminate dandruff and fight against its reappearance. Benefits: It has an antiseptic, soothing and balancing effect on irritated skin. How to use: Apply to wet hair, distributing evenly. Rinse thoroughly. DAMAGED HAIR SHAMPOO Restructurizing Shampoo Shampoo for a repairing action. Thanks to its formula with nourishing active ingredients smooth the hair fiber intensifying its brightness. Benefits: Strengthens the hair bulb. Gives brightness,elasticity and volume. How to use: Apply to wet hair, distributing evenly. Rinse thoroughly. INSIGHT SEBUM CONTROL SHAMPOO 500 ML. Rebalancing Shampoo Deeply cleanses, rebalancing the skin and controlling the excessive sebum production. Benefits It has an effective astringent, emollient and soothing action. How to use Apply to wet hair, distributing evenly. Rinse thoroughly. Its active Algae extract agent impenetrates hair, deeply moisturizes, repairs and restructures damaged, lifeless hair. Perfectly cleanses while olive oil active ingredient makes hair silky and illuminating shiny. Instantly hydrates and nourishes the structure of dry and damaged hair. Perfectly cleanses, while its active Aloe Vera ingredient - rich in Vitamins and Minerals - enhances hair growth and provides hair silkiness, luminous shine and volume. Thanks to the high concentration of Antioxidants, Minerals and Vitamins of Blueberry extract, this rich shampoo instantly revitalizes dry, damaged, chemically treated hair. Its pure Avocado oil content deeply nourishes the hair and the scalp. Gently cleanses, while making hair healthy, flexible and shiny. This gentle vitalising shampoo de-frizzes and hydrates thirsty curls. Its curl-optimizing active ingredients enriched with Bamboo extract, Olive oil and Vitamin-complex create controlled, moisturised, beautiful curls. Recommended for dry and damaged hair. Its nourishing milk protein strengthens the hair structure. With its use hair regains its silkiness, shine and vitality. Energising shampoo based on active ingredients such as Avocado oil, the Ginseng-, the Orange- and the Lemon extract enriched with Vitamin B3-, B5-, B6-, C-, E perfectly cleanses, while nourishing, hydrating the hair and stimulating hair growth. Deep repairing, intensive nourishing shampoo with Omega-6 complex and Macadamia oil. Perfectly cleanses, while restoring the structure and shine of dry, damaged, lifeless hair. Makes hair and split ends well moisturised, nourished, silky and radiant. 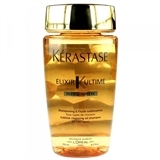 Elixir Ultime Bain Riche is a shampoo for all thick, dry and dull hair. Combining precious oils, it deeply nourishes the hair, for shinier result. 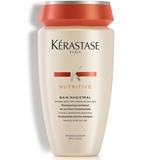 Kerastase's Bain riche Elixir Ultime expands shampoo techniques for improved nutrition. The result is perfectly enhanced hair that feels as gorgeous as it looks. 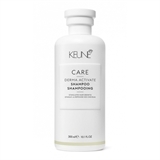 This scalp-clearing shampoo de-flakes, refines and rebalances the scalp’s natural function. It has mild cleansing and clearing properties and it especially perfect if your scalp is itchy, irritated or dandruff-prone. The active ingredients inside calm the scalp, clear dandruff and prevent new flakes from forming. Meanwhile, the shampoo’s anti-bacterial properties relax the sebaceous glands, soothing itchiness and irritation. The result: a properly functioning scalp and lovely, healthy hair. 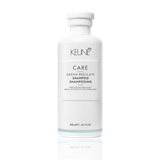 Keune Derma Exfoliating Shampoo - Scrub and balancing treatment for dandruff. Keune Derma Exfoliating contains Octopirox and Liposomes: When used regularly, the flaking of the scalp will be reduced or stopped. This mild shampoo is perfect for those with dull, dry hair. The innovative, light formula leaves hair refreshed, healthy and gorgeously shiny.